Bloomsbury, February 24, 2015. 324 pages. Look at that! 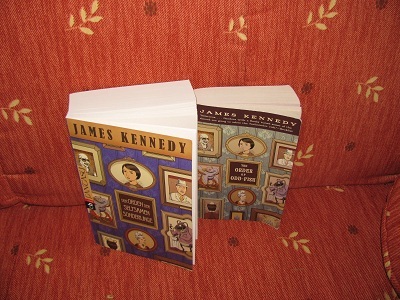 The Forgotten Sisters has been released earlier than the date printed on the Advance Reader Copy. So I need to post my review! This book is the Advance Reader Copy I was most excited about getting at ALA Midwinter Meeting – and the first one I read, immediately after the conference. 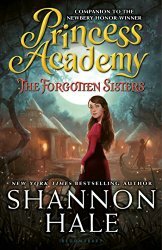 This is the third book after Princess Academy and Palace of Stone. I believe readers will enjoy it more who have read the earlier books – and reading those books will be a treat, if you haven’t yet. Princess Academy is a simple story about Miri and the other girls from her mountain village learning to negotiate and make their way in the world, while one of them will be chosen to be the princess. In Palace of Stone Miri and the other academy graduates go to the capital city in the lowlands – and learn about politics and rumblings of revolution. In The Forgotten Sisters, the outlook gets yet broader as war comes to Danland. But the beginning of the book simply has Miri excited about going home, back to Mount Eskel. Then she is summoned by the king moments before the traders who were going to take her home must leave. In the royal breakfast chamber, the king and queen, all thirty-two delegates and three priests of the creator god are assembled. Steffan leaned forward to grip a chair back. Britta reached out for Miri’s hand. Stora was the largest kingdom on the continent. Miri imagined its vast army pouring into tiny Eris like all the sands of a beach trying to fill a single jar. And Eris bordered Danland. “Danland can no longer take for granted our longstanding peace with Stora,” the chief delegate continued. “We must secure an unbreakable alliance. Stora’s King Fader is a widower. The delegation has decided to offer King Fader a royal daughter of Danland as a bride.”. . .
“The highest ranking royal girls are His Majesty’s cousins,” said the chief delegate. “They live in a territory known as Lesser Alva. Three girls. King Fader of Stora will have his pick of them for a bride, if he agrees to our offer.” . . .
“Living in Lesser Alva, I suspect the girls are not very, shall we say, refined,” said the chief delegate. “The priests of the creator god have called for a princess academy to prepare them, and the delegation approved it. We require this girl to go be their tutor.” He gestured toward Miri without looking at her. Miri doesn’t want to go; she wants to go home to Mount Eskel. But she works out a deal that if she does go, and if she is successful and King Fader marries one of the girls, then the people of Mount Eskel will be given the land where they live (which the king was thinking of selling) and the quarry where they make their livelihood. However, when Miri arrives in the swamp that is Lesser Alva, she finds things not at all as she expected. The three girls do live in a white house made of linder. But the house is empty, the girls’ mother is dead, and they are destitute. They haven’t seen anything of the allowance supposedly sent to them every month by the king. They don’t have time to learn about being princesses, because they need to go out in the swamp and hunt for food. We do come to enjoy the three sisters, Astrid, Felissa, and Sus. Here is a scene shortly after Miri has met them. “Never ever,” said Felissa, nodding. “In fact, we could have killed you on the spot and cut you up for meat,” Astrid said, casually cleaning out her fingernails. “No one’s ever really done that,” said Sus. So first, Miri must win the girls’ trust. But she also needs to learn the ways of the swamp and help in the hunt for food. But it’s also urgent to find out where the girls’ allowance is disappearing – because the same corrupt people are not letting Miri’s letters get out of Lesser Alva. However, that’s only the beginning. War from Stora does come to the swamp. Miri needs to get the girls to the capital city and King Fader in hopes of sealing that alliance. But none of that is simple, and many things turn out to be different than they seem at first. I like all the complexities and diplomacy and cleverness that Shannon Hale builds into these books. In each of the books, somebody gets outsmarted. Miri again shows her worth – and this time the Forgotten Sisters get to contribute as well. And I won’t give anything away, but the Epilogue puts a nice cap on the entire trilogy. Shannon Hale has done it again! 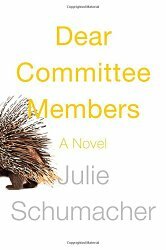 She’s written an absorbing further tale of a simple girl from Mount Eskel who makes things right, and changes the world while doing so. Henry Holt and Company, New York, 2015. 36 pages. It’s books like this that make me wish we had a separate children’s browsing section for Nonfiction, rather than interfiling them with adult books. This is not a book for children looking for the subject of Bears, although that is where it is filed. This is a heart-warming picture book story that happens to be true. I knew that the name of Winnie-the-Pooh was inspired by a bear Christopher Robin visited at the London Zoo. This book tells the story of that bear. The bear was born in Canada during World War I. A veterinarian who took care of the horses in the Canadian army saw the bear for sale when his regiment stopped at a train station. The man said he didn’t see the cub until after he’d shot her mother, so Harry Colebourn bought the bear and named her Winnipeg, after his company’s hometown. Winnipeg, whose name was quickly shortened to Winnie, was friendly and affectionate to the whole troop, but especially to Harry. She traveled with them to training camp in Quebec and then across the Atlantic Ocean. But when the company was sent to the fighting in France, Harry decided that Winnie would be better off in the London Zoo, which had a new exhibit for bears. Winnie adjusted so well that four years later, when the war ended, Harry decided she should be allowed to stay. Even though this book has a back story of war, the author and illustrator have made a very readable, light-hearted tale. They show Winnie cuddling and playing with Harry and the other soldiers. I was very surprised that the London zookeepers actually let children ride on Winnie’s back and feed her condensed milk with a spoon. It’s hard to imagine any zookeepers anywhere allowing that today, but perhaps it’s a testament to how gentle Winnie was. And it’s fitting that the bear who inspired one of the greatest books of children’s literature should now have her own story told. 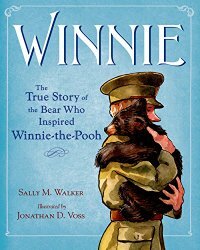 Fans of Winnie-the-Pooh will love hearing the back story, but this story goes beyond that and simply tells a heart-warming story of a young man and a bear who was generous with her affection. I have a new book to look at today! 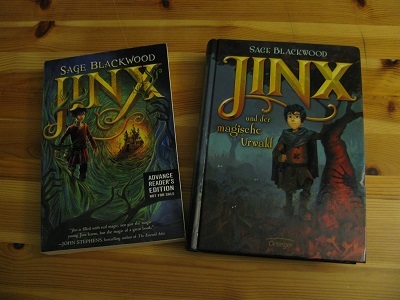 I found this German edition of one of my favorites, Jinx, by Sage Blackwood, on Amazon, and I had to order it! You can see that my copy is an Advance Reader’s Edition — hopefully there weren’t too many changes. Oh! Surprise! This is one of the few books that is shorter in German. Maybe because of the bigger pages? It’s 360 pages in English, and only 351 in German. Wow. Looking more closely, that’s even with the English Chapter One starting on Page 1, but the German Erstes Kapitel starting on Seite 7. I’m going to begin with some interesting front matter. The translator’s name is Sylke Hachmeister. This translates to: Sage Blackwood lebt am Rande eines dunklen Waldes, mit Tausenden von Büchern und einem sehr alten Hund. Sie liebt es, zu tischlern und zu kochen, und macht gerne Spaziergänge durch die Wälder des Bundesstaats New York. Jinx has a classic opening line, so let’s look at that. = Im Urwald wurde man entweder schnell groß oder gar nicht. Here are some good-to-know phrases for your next foreign adventure! “Bergthold drew himself up.” = Bergthold straffte sich. That’s a good stopping place for now, just before a violent death. I feel like I need to walk in the woods to get good use out of these phrases — which makes me miss living in Germany, where there are always plenty of woods to walk in. Have a wonderful week! It may be a cold winter, but at least it’s not a Hungerwinter! Beach Lane Books, New York, 2014. 32 pages. 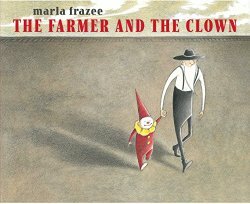 I’m already a huge fan of Marla Frazee’s art. I became so by reading the Clementine books. You can see her distinctive style in these pages, especially the adorably round kid faces. This is a wordless picture book. It tells a simple story, but one bursting with life. An old-fashioned farmer is working in his flat, brown fields, when he sees a circus train go by. Then a small clown child falls off the train. The farmer goes to him and takes him home. The two spend a night and day together before the train comes back. In the process, they become friends. And the way the artist shows that friendship developing is where this book is a work of genius. Parents who are all about their children practicing reading may not realize how much a wordless picture book can do. They even work wonderfully for storytime. You can ask children what is happening, and you will be amazed at the things they notice and the vocabulary they use to describe it. What’s more, children who haven’t yet learned to decode letters will be delighted to be able to read this book. And they will learn the sequencing of a book, going from left to right and from front to back. Even for older children, who have mastered reading, this book has so much to offer. At last he’ll get to take Jedi pilot training! And he already has friends! But the pilot instructor doesn’t seem to like Roan after the flight simulator almost blows up on his first flight. And things go wrong with his friends. The girl he likes hardly talks to him. 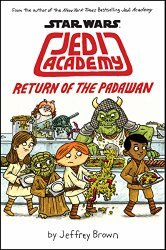 Basically, he’s got all sorts of regular middle school problems — only they’re happening at Jedi Academy. And Roan’s a budding cartoonist, so the text never gets long and involved and is always broken up with comics. I haven’t seen the first volume of this series on the shelf much since it was published (always checked out), and I am sure the same will be true for this one. And at the back, Roan gives tips for making your own comics. Candlewick Press, 2014. 40 pages. This book is simply genius. So simple. And so much to notice. 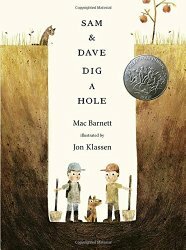 The plot is that Sam and Dave dig a hole. “When should we stop digging?” asked Sam. “We are on a mission,” said Dave. Their dog goes along with them on their adventure. In each spread, we see the cross-section of the hole — and that they keep just missing a spectacular treasure, in fact, they keep missing treasures that get more and more spectacular. The dog, however, knows what they’re missing. In every picture, he’s got his nose pointed toward the treasure that the boys are missing. They decide to stop digging downward, to split up, to turn corners — all just before they would have found treasure. Finally, the boys stop and take a nap. This time, the treasure they have just missed is a bone. That one, the dog is not going to leave be. But when the dog digs for the bone, the floor of their tunnel collapses and they all fall down. . .
until they landed in the soft dirt. for chocolate milk and animal cookies. At first glance, it looks like they have landed in their own yard, which was pictured at the beginning. At second glance? Well, something has happened here. Here are his theories about what happened in the book. And later, he revisits and gives us a link to what Aaron Zenz and his 9-year-old son think happened. So you see, this is truly a book for all ages. The words and pictures are simple, even iconic. But the details! And the philosophical questions! This is a book that, besides being a joy and delight, will spark conversations. Houghton Mifflin Harcourt, 2014. 40 pages. I love this kind of nonfiction for kids – It’s engaging and simply told, with plenty of facts, but written to be read and enjoyed, not to use as reference for a report. 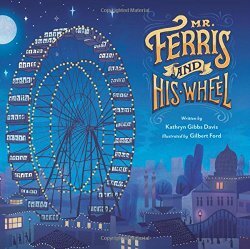 This is a picture book, and the illustrations are beautiful, evoking the time of the Chicago World’s Fair, when Mr. Ferris built his wheel. Now it was America’s turn to impress the world at the 1893 Chicago World’s Fair. But what could outshine the famous French tower? And who would build it? A nationwide contest was announced. Before TV and the Internet, people from around the globe gathered at World’s Fairs to share their different ways of life and new technologies. Tasty inventions such as hamburgers and Cracker Jack first appeared there! It goes on to dramatize George Ferris getting the idea, submitting his plans, and the large technological challenges they faced. One of the pages during the construction phase shows spectators who are critical and skeptical that the thing will stay up, let alone actually work. The author and illustrator dramatize the completion, and the very first ride, giving us a feeling of the majestic spectacle the wheel made, as well as the sweeping view of Chicago. All summer, visitors from around the world traveled to the Chicago World’s Fair. It didn’t matter whether one was a senator, a farmer, a boy or girl. Everyone wanted to take a spin on the magnificent wheel. Adventurous couples asked to get married on it! On hot, steamy days, the wheel was the perfect place to escape up, up, up into the cooling breezes. All you needed was fifty cents. [Sidebar:] During the nineteen weeks the wheel was in operation, 1.5 million passengers rode it. It revolved more than 10,000 times, withstood gale-force winds and storms, and did not need one repair. Let’s hear it for a book that highlights the heroism and accomplishments of an engineer! This book tells a good story, but it will also capture kids’ imaginations. A page at the back supplies further reading and websites. Who knows? This book may inspire future engineers. Hooray! At long last, it’s again time for Sonderling Sunday: That time of the week when I play with language by looking at the German translation of children’s books. I hardly got to it when I was reading for the Cybils. And then I wanted to catch up on posting reviews. And then I went to ALA Midwinter Meeting. And had a medical scare. (Benign!) And have just been busy. So tonight I may not be able to go as long as I’d like. But I am going to do it. And since it’s been awhile, I am going to go back to the book that started it all, Der Orden der Seltsamen Sonderlinge, The Order of Odd-fish, by James Kennedy. Last time, we actually finished up Chapter 17, so we are on Kapitel 18, which is on page 223 and Seite 281. = Jo und Audrey freundeten sich rasch an. Apparently “to friend” was a concept in German before Facebook! Okay, that’s actually a good stopping place — the end of the first section of Chapter 18. Perhaps if I give it a short segment tonight, it will be easier to get around to next week. And this week I’ll wish you someone with whom you may friend yourselves rapidly! You are currently browsing the Sonderbooks blog archives for February, 2015.